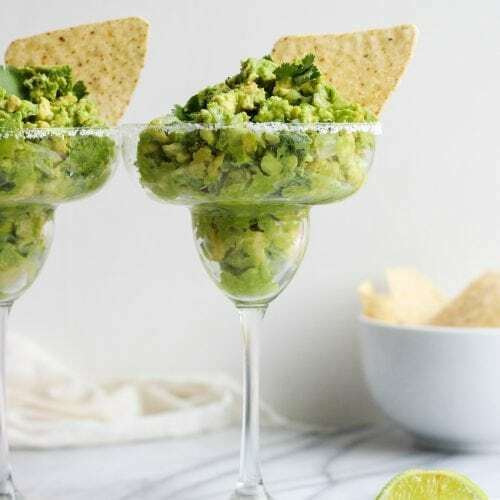 Guacamole Dip is a staple for game day, Cinco de Mayo, and summer parties. This delicious Margarita Guacamole Dip recipe is the perfect party dip, and it's so easy to make too. The secret? A bit of tequila mixed into the guacamole for an extra kick! 1-2 teaspoon tequila opt. but a great idea from our friend Susie G.
Heat 1 T butter and 1 T olive oil in a skillet. Add onion and saute until softened and translucent. Add chopped garlic (if using) and saute with the onion for 1 minute. Sprinkle the onion and garlic with 1 t. brown sugar, cook for 1 minute. Take the onion & garlic off the heat to cool before mixing into the avocado mixture. Mash together gently, but leave the avocado a little chunky (at least that is how I love it). *I use prepared garlic in a jar. Usually found in the produce department in most grocery stores.